Pinterest is the third most popular social networking site right after Facebook & Twitter. It has been observed Shoppers that come from Pinterest are 10% more likely to make a purchase as compared to visitors from other social networking sites. As per wishpond, over 2 million people create product pins everyday. Given the above statistics it’s clear that Pinterest has emerged as a powerful platform for marketing your business. Whether you are a B2B company or a B2C company, you cannot afford to ignore this social networking platform. It is certainly a great platform to reach a wider audience, increase your brand visibility and connect with your potential customers and influencers. However, to get the maximum results you need to know how to use Pinterest effectively. To connect with your audience, you need to constantly come up with a fresh stream of content that resonates with the interests of your audience. I know you have heard it a million times already but you need to create content that is a hit with your audience. But how do you do that? 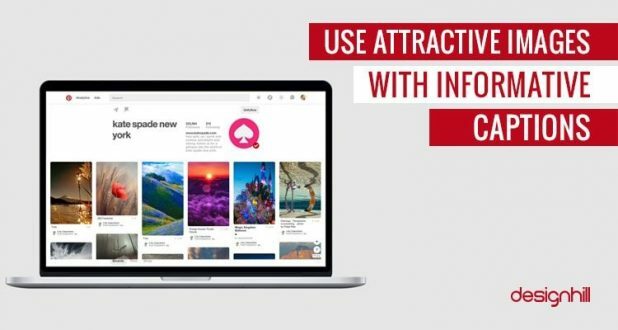 Use Pinterest analytics to explore the interests of your audience. First, you need to check domain activity on your Pinterest analytics. Consider clicks to understand what kind of images are driving people back to your site. Once you follow the above steps, you get a baseline that gives you a fair idea about what works with your audience. Now you can create your content around these interests to get maximum engagement out of your pins. However, keep testing from time-to-time to know which images are performing best for you. Remember, it is not only about creating great content, you need to also share great content of others as well. Building a relationship with influencers can give your business instant recognition and exposure. 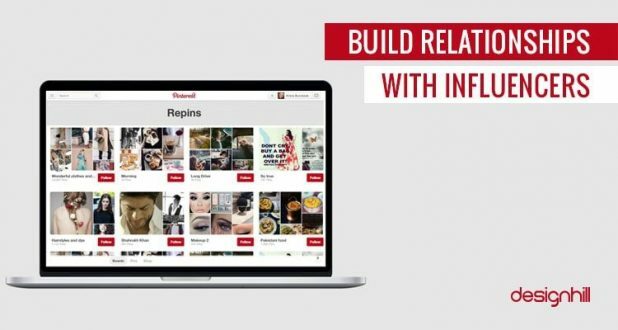 Like every social media platform, Pinterest has online influencers that stand out in their niche. Start by finding online influencers who already have the attention of your potential customers and start following them. You can repin their content and make comments on their pins as well. This can give you a decent start in building relationships with your influencers. Many brands have benefitted with this approach and have received immense exposure. You can explore rich pins on Pinterest to promote your business exponentially. Rich pins can be divided into five categories and all these rich pins give you the option of adding topic-specific details. Product Pins- If your company is into selling products, then product pins are a good option for making shopping convenient. You can add buying information, pricing details and more. Article Pins– Article pins allow you to add details like story description, headline, name of the author and link. Place Pins- In place pins you can add contact details, address info and a map. Recipe Pins- All details of ingredients, serving sizes, and cooking times. Movie Pins- Here you can add details of cast members, reviews and ratings. 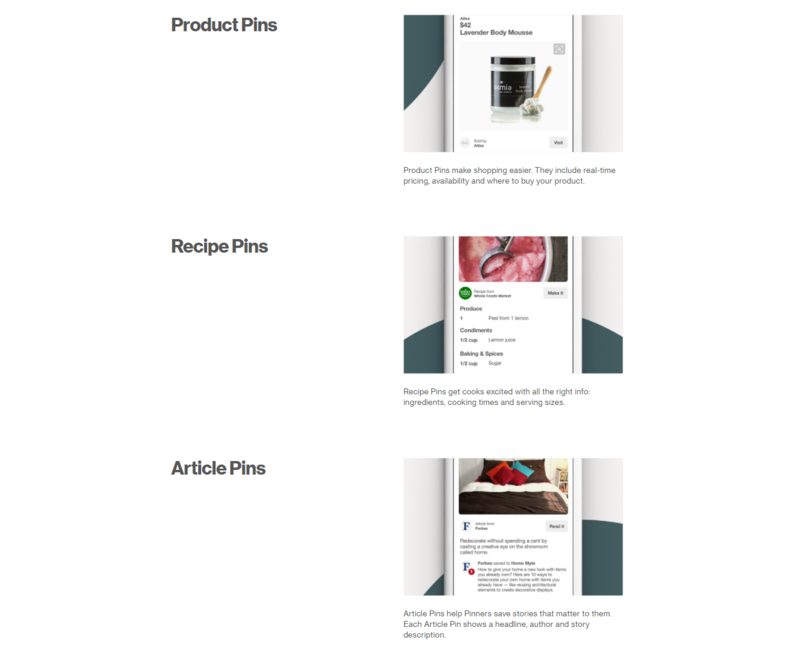 You can add rich pins to your Pinterest account to drive better user engagement. In addition, you need to add relevant meta tags to your website and validate all your rich pins. 4. Don’t neglect changing your pinterest account into an official business account to leverage the full potential of this platform. With a business account you get access to many other features which you don’t get with a personal account such as analytics and metrics which show the number of unique visitors, repins, impressions and visits to your site as well as which visitors are driving maximum engagement. Having a professional and attractive social media design for your pinterest account is also essential to give a boost to your branding. 5. Focus on great visuals – Pinterest as we know is a highly-visual medium so it is worth going the extra mile to create quality visuals. Make sure the images you share are clear, well-composed, and most importantly optimized as per Pinterest’s size requirements. Remember, images should be approximately 600 x 900 pixels and vertical images are the most ideal option. Pins showing products in use in real life witnessed 30 % more CTRs and 170 % higher check out rates as compared to pins showing products alone. For instance – The brand name hunter boots prefer sharing images of how their boots can be worn or carried in style by the user rather than showing a mere close-up of the boots. So, instead of showing only your product pictures, showcase how they can be utilized. Such posts connect with users instantly. The above tips will enable you to tap Pinterest’s full marketing potential to promote your business and ramp up your conversions. Remember, Pinterest is a highly visual medium so make sure whatever content you share has some high-quality images that keeps your audience hooked. Keep Pinning!